Please spare me because I’m so late into the game, yet I’ve fallen head over heels for this little gem of weekend drama currently airing on SBS. It’s been over a month since it first aired and I only get the chance (and mood) to check it out last week, and I’m completely captivated by the drama. I thought that it’s going to be a straight-up melo but it has its own moments of warmth, as expected for a weekend drama. Well, it’s better knowing that angst is surely going to happen somewhere in this drama from the start rather than watching a rom-com turning into an angsty melo (Witch’s Romance, I’m looking at YOU!). I’ve read reviews that praised the younger cast but I learned it the hard way that higher expectation could lead to disappointment, so I left all expectation at the door..and I fell hard for the characters. Kang Ha-neul is so good as Park Dong-joo that I’m thinking of watching Heirs just for him. He’s nailing his portrayal as the obedient son although it’s still a big mystery to me on why people continue to put him in dramas which require him to don school uniforms. Someone please give this fine lad a character that is suitable for his age for I’m sure he’s going to steal more hearts (I am well aware that he’s a heartthrob even in his uniforms!). Nam Ji-hyun…well, this girl needs no introduction and she too, is going to be a leading lady material in the next few years. It’s hard to imagine Soo-wan portrayed by someone else. Tragedies happen, separating the young lovebirds apart and twelve years later, Dong-joo, now known as Dylan Park, leaves USA to go back to South Korea with the intention of finding Soo-wan. One thing that I notice when Lee Sang-yoon first takes over the spot as the grown up Dong-joo is his tone of voice. It’s so similar to Kang Ha-neul’s voice! Dylan is now a successful surgeon and he takes the offer to become the ER Chief where Soo-wan’s father Director Yoon Jae-bum (Jung Jin-young) is still keeping his position as the hospital’s director. I don’t want to spoil too much on the plot but it’s enough to say that Director Yoon shares a complicated daddy and son relationship with Dong-joo that will surely cause a rift between them when the truth comes out. I’m already dreading that moment! Soo-wan (Gu Hye-sun) is working as an EMT at the fire station, because it was Dong-joo’s childhood dream to become a firefighter just like his deceased father. That’s so sweet but at the same time heartbreaking because she has no idea where Dong-joo has disappeared to. She finds solace in her job and she’s still the same tough cookie Soo-wan, causing her endless trips to police station because of her temper. Nevertheless, she begins to suspect that Dylan is her first love Park Dong-joo although the guy is putting a distance in between them. The reason? Dr Kang Ji-woon, a neurosurgeon at the same hospital where Dong-joo is working at. 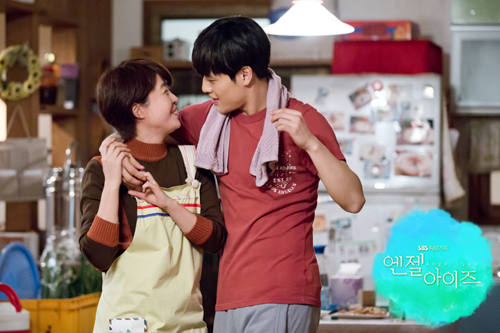 Ji-woon is a sweetie and it’s no surprise why Soo-wan agrees to be in a relationship with him. Dong-joo (who hilariously thinks that Soo-wan has a son) learns that they’re already engaged and begins to treat Soo-wan coldly. Kim Ji-suk, why do you have to be a second lead again?! I am shipping Soo-wan with Ji-woon so much but after she learns about Dylan’s true identity, I realize that Dong-joo takes up most of the space inside Soo-wan’s heart that it’s pitiful to see Ji-woon trying to hang onto her despite her attempts to break off their relationship, afraid of hurting him. His potential friendship with Dylan is put on the line because of Soo-wan and I hope to see them reconcile, because their bromance is gold! After watching Episode 10, I have a new theory that I hope won’t become true. Ji-woon’s mother Director Oh Young-ji (Jung Ae-ri) is one shady woman and I can’t help but to think that her obsessive motherly instinct is what caused her to be involved with Jung-hwa’s death…and it might be related to Ji-woon. I really hope that this isn’t true!! 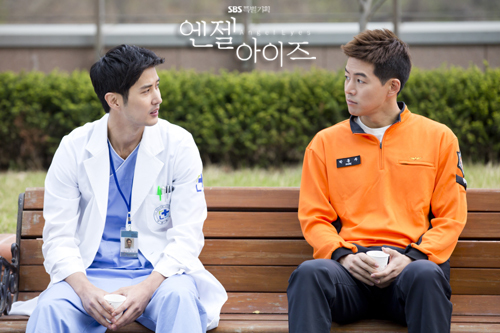 Dong-joo ends up volunteering to become a doctor at the fire station and that means he’s working together with Soo-wan. I swear that this pairing is so adorable that I’m getting diabetes and heart attacks each time they are together. I can’t help but to think that Soo-wan will try to push Dong-joo away out of guilt if she learns about the painful truth, so that’s why I’m both grinning and crying when they’re being so lovey-dovey, knowing what’s coming for them. I’ve survived a worse situation in a drama, so the ‘hells break loose’ scene might cause me to bawl a river of tears. No problem, bring it on! For those who are avoiding this drama like a plague because of the workplace setting, do not worry! The medical terms and emergency situations are kept at acceptable level so we don’t have to rack our brains collectively, trying to digest all those medical jargon. Plus, the side characters are lovely, especially the ER trio and the EMT staff. An honourable mention for Seungri’s Teddy Seo, whose mixed speech of American and saturi is an immediate, effective comic relief when the time calls for it. That doesn’t mean he’s a character without any worries for he has his own issue. In fact, each of the character has his or her own story and it’s possible to find one of your liking. i shouldn’t be online right now, but i HAD to say YAYAYAYAYAYYYY!!!!!!! uuuuuuwwwwwaaaaahhhhhhh! Im so happy you’re in it too….. I really love this drama so much, and im addicted to Dylan’s dimple.. haha.. her younger sister Ellie is so cute too.. I just wish, you’ll make a recap for this, its not to late…hehe.. Fighting!!! been relying on live recaps on the soompi forum all this while, but now you’re gonna do the recap for us.. Yes..agree amazing cast and each week am already anxiously awaiting next episode the moment I finish present week’s. Addicted? Definitely!